Today, our school was privileged to be visited by eight police officers, including members of the Australian Federal police force. 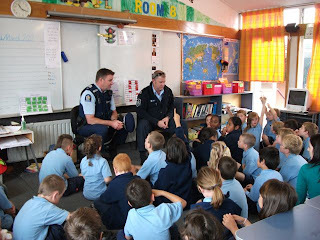 These officers are in Christchurch to help in the aftermath of the earthquake, and are visiting schools as part of a Reassurance Team. 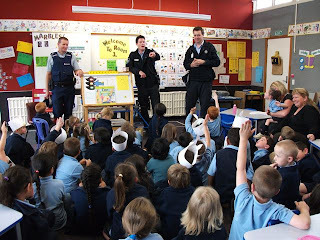 The aim of this team is to talk to children about the earthquake and to acknowledge that there are lots of different people in uniform from all over the world helping in our city at the moment. 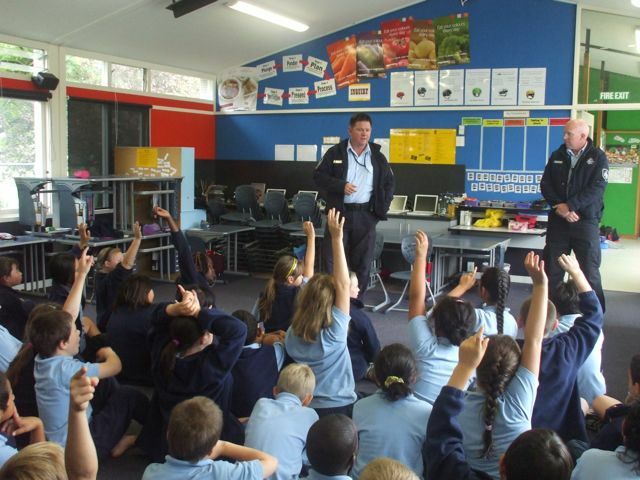 The officers spent time with different classrooms answering questions and listening to the children tell their own stories. Later the children asked many questions of the Australian officers, including "How did they get here?" " By Quantas 757 "was the reply. The child responded "Oh , so you didnt come to Addington in a taxi" Wonderful!!! There were also many gun, taser and pepper spray queries! It was a great visit that both the adults and the children enjoyed, and helped reinforce for us all the special relationship between Australia and New Zealand in times of crisis.